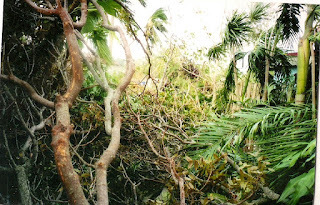 My Mahogany tree ripped to shreds and defoliated after Wilma. Anytime there is a hurricane brewing in the ocean the weather forecasters predict doom and demise. 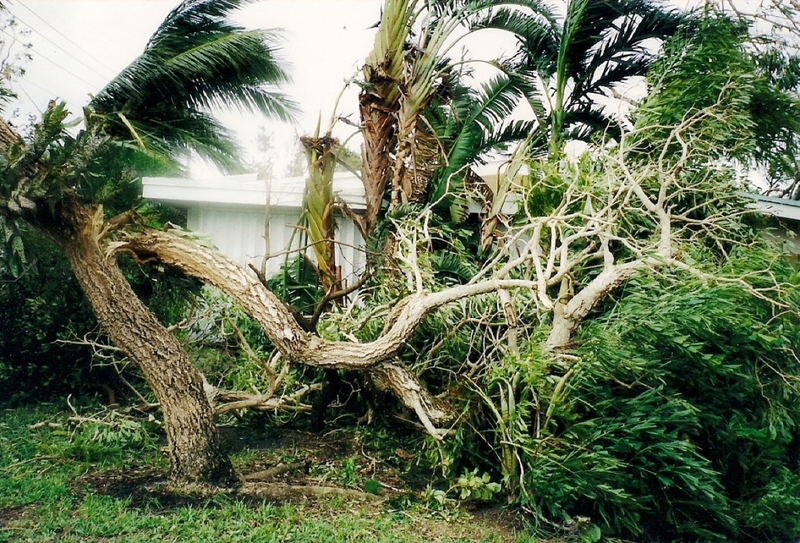 The television reporters show terrible damage of previous storms, days before the storm is anywhere near Florida. Reporters stand with a wet slicker near a swaying palm tree (they always sway) and dramatically scream into the microphone while someone off camera throws a bucket of water in their face. By the time the storm is near, the local grocery stores are stripped bare of bread, water, peanut butter and every sort of canned food available. You are popping Xanax like jellybeans. Meanwhile all the patio chairs, tables, end tables, garden whimsy, has been moved to the living room. The house looks like an outdoor furniture store. All the valuable orchids, rare potted plants are also in the living room, so it looks like a nursery. 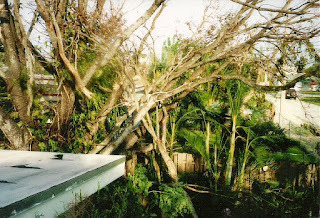 My Tabebuia tree killed by the viscous hurricane Wilma. View from my Florida room of the back garden. The hurricane shutters are up so the inside of the house is dark, even in the daytime. You sit and wait, sit and wait. Hopefully the power will remain on for a while. Thomas Edison invented electricity over one hundred years ago and the wood pole and wire system he invented has not changed. A new 25 year old community called Weston has electric underground and never loses power. Here in Fort Lauderdale the lights flicker on and off all day long and with the slightest gust of wind, the lights go out. 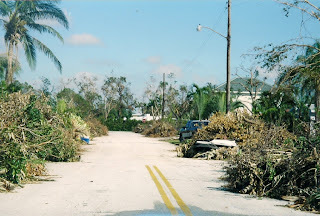 We were without power 16 days with Wilma. Grocery stores closed. No gas at the pumps. There were nightly curfews. No traffic lights. If a policeman saw you driving, he would stop you and ask where you were going. 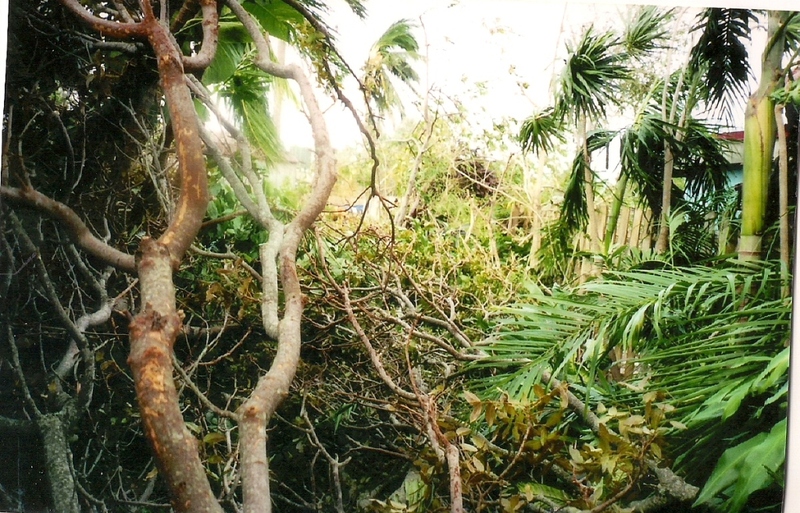 My backyard after the hurricane, with piles six feet high of plant debris. 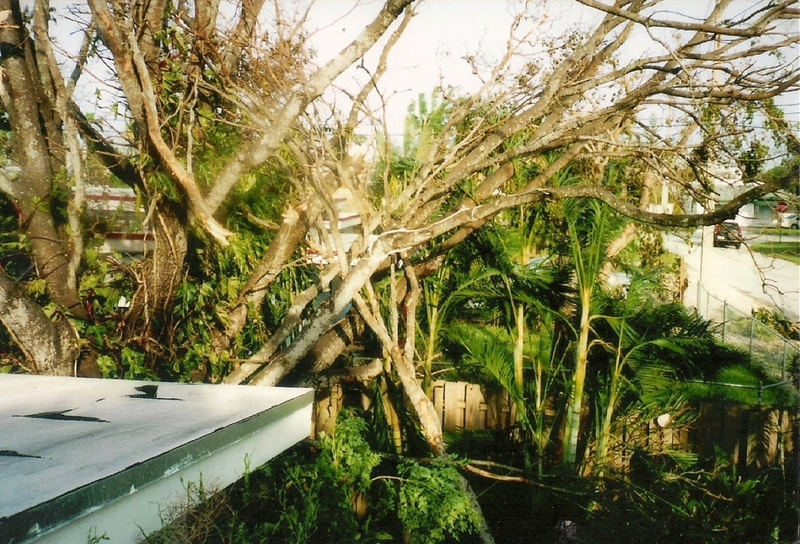 These photos remained in an envelope for 7 years since Wilma, I could not bear to look at the devastated garden. It was like losing a close friend. Everything was destroyed. 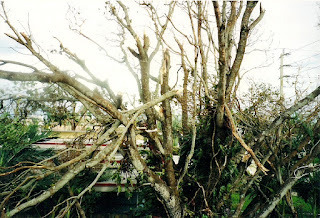 The huge eighty year old mahogany tree was mangled beyond recognition. The branches fell on my roof and the neighbors as well. Branches fell to the ground like a can of pickup sticks. 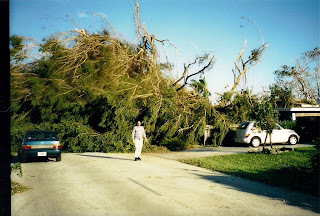 It took a crew of five men all day to chain saw through the mess and carry all the branches away. All the delicate tropical plants were sun burned to death without the tree canopy, smashed to death, or dried out since we had no rain and the sprinkler system could not run without electricity. Trees in the front yard were fallen down every which way. 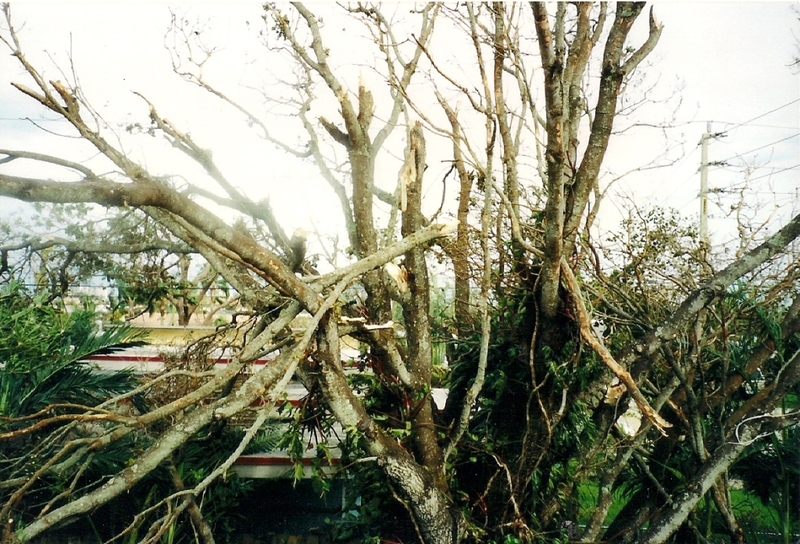 A large percentage of the neighborhood tree canopy was destroyed. A neighbor’s Ficus fell down into the roadway, blocking traffic in both directions. The road remained closed for days. Tree blocked the entire street for days. No cars were able to pass. My parents are evacuated from their condominium every storm as well and they stay with me. No comment. They read my blog. Just kidding Mom and Dad! 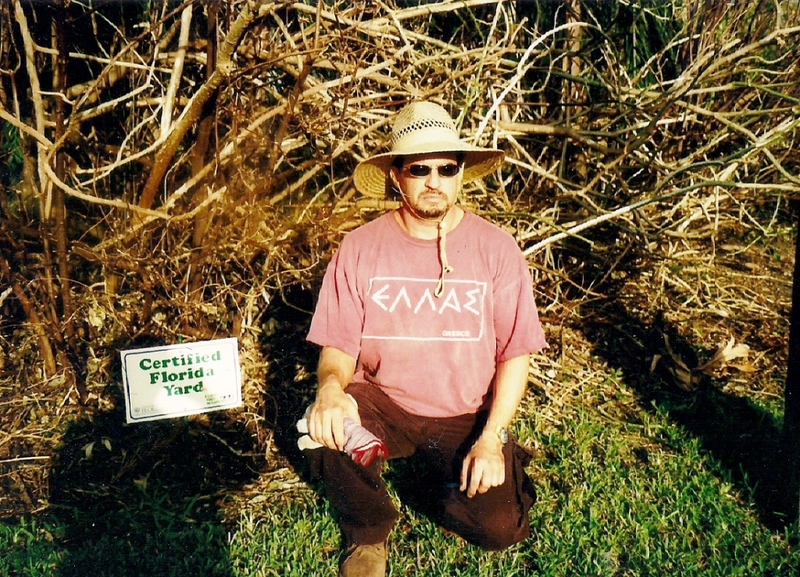 I invited the president of the Wilton Manors garden club to come over to see my garden after he was nice enough to host the members of the club to his house. Problem was, I blurted it out spur of the moment, not thinking of the overgrown shrubs, foot high weeds, and dead potted annuals that succumbed to the summer sweltering heat. Since I work full time as a horticulture therapist during the day in the field (pun intended) and do administrative duties in the evening and social networking, it gave me little time to prepare. Early in the morning before work, and early evening after work, I weeded, raked up leaves and purchased some summer annuals to spruce up the yard. Here is the orchid before it vanished. My pride and joy was a wonderful Vanda orchid that was blooming a second time this year. Low and behold when I looked at the orchid, the flower had vanished. I was shocked and very disappointed. It looked as if the stem was cut off at the base of the plant. What could have happened to it? Several scenarios ran through my head. The president was coming over the next day and this was the best flower of the orchid collection. Over the weekend I was shooting a video near the orchid the day before my visitor was scheduled to arrive. My cameraman spotted the flower nestled among the branches of a shrub under the hanging orchid on the tree. I decided to re cut the stem and take some wonderful photos. Just make the best of a tough situation. My guess is that when we were removing large palm fronds from the garden, they brushed into the hanging orchid and it severed the stem. Mystery solved. The tour went well and the president got to take home a care package of cuttings from my garden for his garden. Have a wonderful week and thank you for coming by! See you again soon. Enjoy my garden page on Facebook, please "like" it. Loads of photos there of the garden and horticulture therapy in the albums. 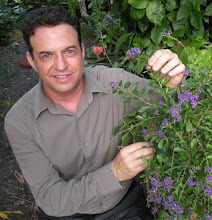 You may subscribe to my Miami Garden Reporter articles for free, just hit the subscribe button in the link.